As you may know, this year I took on 2 internships, one of which is to be a research and writing assistant on a new feminist book project of one of Brandeis’ professors: Rosalind R. Barnett, and her writing partner, Boston University journalism professor, Caryl Rivers. The title is called Move Over, Ms. Nice and I’m basically in heaven working on this project. My latest assignment required me to write about how strong women have to please men in order to survive, and like the nerd I am, I used this as an excuse to talk about Wonder Woman and give voice to some of my greatest complaints about Disney’s treatment of my three favorite, “Disney Princesses:” Pocahontas (Pocahontas, 1995), Mulan (Mulan, 1998), and Merida (Brave, 2012). In the current polarized society, with misogynists and meninists both fighting feminists and women in general, empowered women are often the targets of attacks. There are a few, however, who have managed to maintain their power by also appealing to men by exhibiting other traditional feminine qualities. An example of this is Wonder Woman. Created by the man who developed the lie detector test who was husband to a suffragist, the Amazonian warrior was a feminist from the start. I, personally, am SO freaking excited for the upcoming Wonder Woman film. It’s partially because she is my mom’s favorite superhero, and because she is just SO amazing. If you have the Batman vs. Superman: Dawn of Justice movie with the extras, the Wonder Woman specials, “The Warrior, The Myth, The Wonder” and “Wonder Woman: Grace & Power,” are just great. I’m so excited to see Gal Gadot play Diana in her own movie (though her appearance in Batman vs. Superman: Dawn of Justice was pretty awesome, especially this scene—and her theme song just makes me so giddy!). Her appearance, however, clearly reflects the male gaze in which she was created, and is a probable reason men did not reject the character like many of the anti-suffragist comics from the time. The films are making them more warrior-like and functional, but she’s still definitely running around in a strapless top and skirt which does annoy me to no end because it’s clearly meant to get boys interested. Perhaps a more pervasive example of idealized female characters are the Disney Princesses, an exclusive title bestowed to currently only 11 characters who meet certain requirements. The original three, Snow White, Cinderella, and Aurora (Sleeping Beauty), are by no means feminist icons. The Disney Renaissance Era “Disney Princesses” are Ariel, Belle, Jasmine (Aladdin), Pocahontas, and Mulan. The latest additions from the Disney Revival Era are Tiana (The Princess and the Frog), Rapunzel (Tangled), and Merida (Brave). Starting with the Renaissance Era, as the Disney Princesses become more empowered, they also speak increasingly less than their male counterparts. Another article points out that speaking time isn’t the only measure of a heroine’s impact, such as the heroines receiving more recognition for their skills (rather than appearance). Where Disney miscalculated in the Disney Princess merchandise line was the unnecessary makeovers given to its most agentic heroines: Pocahontas, Mulan, and Merida. Pocahontas transformed from a Disney-fied human into a polished runway model (even though Pocahontas II was all about her not wanting a makeover). Mulan changed from her simple clothes to wearing a glitzed up version with heavy makeup (despite the fact that her defining character song “Reflection” features her symbolically wiping the makeup off to reveal her true self). Merida (who spends the first part of the movie rejecting everything to do with dresses in favor of her bow and arrow–Brave was even initially titled The Bear and the Bow) has become a flatter, thinner, bow-less girl in a glittery dress. These three are the leading characters in their stories, and were commercially successful enough to garner themselves the “Disney Princess” title. There is a reason these movies were popular—young girls liked these strong, independent, agentic characters whose accomplishments were more substantial than merely getting their own happy end: Pocahontas saves her tribe and taught (some) of the white settlers that Native Americans were not savages, Mulan saved China and was bowed to by the Emperor (which ranks her higher than his family, or any traditional princess title), and Merida saves her mother and restores peace between the three other clans. Why, then, would Disney eviscerate them by removing their best qualities to make them more marketable? These mixed messages are not only bewildering, but also have negative effects on girls by magnifying stereotypes. If people still accepted Pocahontas, Mulan, and Merida in their original forms, are the tamed versions needed? 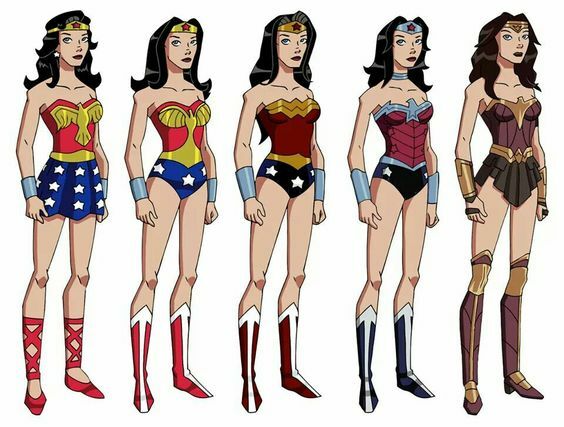 With Wonder Woman’s upcoming live-action silver screen debut led by a female team with the fierce Gal Gadot as the leading lady, the question becomes: are younger generations able to see new or revamped feminist icons as inspiring without fearing they are misandrists out to destroy the current patriarchal structure of society?